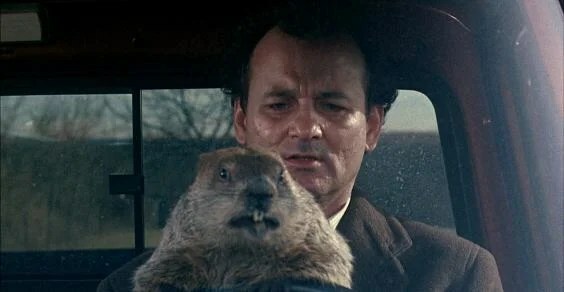 In the movie Groundhog Day Bill Murray plays a weatherman who wakes up to discover that each day is February 2nd and is forced to relive it over and over again. Finally, after what seems like a lifetime of anger, bitterness, nastiness, depression, and a lot of humor, he changes his fate by changing his behavior. I never tire of watching this movie. It has such a feel good message of redemption through personal growth. At the end of the movie the Murray character talks about marrying his sweetheart and moving to the small town of Punxsutawney, PA. For more about the movie, here is a link to the wikipedia article. If you haven’t seen the movie, here is the trailer. One of the things I struggle with is feeling productive. This troubles me at times because the opposite of productive, in my mind, is laziness or inactivity. Both of these words have negative connotations. How about replacing lazy with thoughtful, and inactive with restful or rejuvenating? I read a blog today which reminded me of this conundrum. It’s a post about “goal overload” and the “fear of missing out” that comes from having so much out there to read and do that we end up multi-tasking and not really focusing sufficiently on what’s important. The blog post is called Information Overload and the Tale of the Deadly Pear. I think you’ll come away with some new ideas about our busy lives after reading it. Now back to Bill Murray and Punxsutawney Phil. In the movie, the moral of the story is that being nasty and self-centered and ambitious is bad, and being kind and generous and wanting a smaller life is good. While simplistic, it’s an idea that contradicts the American dream that hard work and some luck will give you the riches you deserve. In my own life I’ve been putting this idea on its head. For me, hard work and sacrifice has given me the chance to do less but get more. When my kids were little I didn’t go on field trips with them or go into the school to help out. I was working full-time and trying to get ahead at work in a male-dominated workplace. Like many other women of my generation, I had to work harder and longer to get the same recognition. I had to prove that having children didn’t mean I wasn’t serious about taking on more responsibility. When opportunities to travel came up, I enthusiastically raised my hand, and had to figure out later who would care for my children in my absence. This was when I was a single mother. I never felt guilty because I was earning a living, that eventually became a good living. I began to feel guilty about going home early and not working hard enough. Instead of goal overload I reveled in my ability to multi-task and juggle multiple projects in my head. In nearly every position I was the most productive person in the office, frequently called upon to lead up new projects because my bosses were confident that I would bring it to successful completion. Down time: or is it just wasting time? One thing I have now that I didn’t have six months ago is down time. It has other names: innovation time, thinking time, or any number of phrases that suggest getting beyond the mundane and on to the big stuff. What do I accomplish during this time? The biggest thing is peace and calm. I have learned to use mindfulness to focus on the present moment and to truly enjoy it without letting other thoughts intrude. This in turn leads to low stress. I find that when I do have something hard to do, I can drill down on it with an intensity that I couldn’t do without that “break.” The other thing I have achieved is greater patience. While some things still irritate me — like telemarketers trying to sell me the same thing I already said no to the last time they called, and the time before, for the most part I deal with each interuption with aplomb. Yet, some days I really don’t get a lot done. I neglect the laundry and the dog and my book group book. I have documents to review and agendas to create. I delay and spend time on other things instead. I read about Donald Trump’s tweets and the Bill Cosby case (remember, I live in Pennsylvania) and look at the latest science article in the New York Times or a new recipe. What starts out as reading the news ends up wasting time. Or is it? What is the definition of wasting time and what does it mean to use your time well? Who decides? At work it’s easy. You get your performance review and your boss tells you the answer. Either you’re a star performer or you missed the mark. Being a star performer used to energize me to even greater feats. Now it exhausts me. I was reading an article today about how one negative piece of feedback needs five positive pieces to counteract it. That’s why we feel so bad when we make a mistake. What grade would I give myself today for my performance? In Groundhog Day Bill Murray keeps repeating the same mistakes. The truth is in front of him but he doesn’t see it. He doesn’t listen to others when they tell him about his big ego; he simply sneers and brushes it off. He knows better, no one can teach him anything. To become a better person he has to experience heartache and pain, both emotional and physical. He is so distraught with his fate ands powerlessness to change it that he tries to kill himself multiple times in the movie. In the end he learns that caring for others and acting unselfishly make him happy. He decides to treat people with generosity without expecting anything in return and is rewarded. His nasty behavior brought him nothing but pain. As he attempts to save a homeless man from dying he finally gets it. Life is as much about service to others as it is about achievement. Are we doomed to repeat our mistakes? Is this what the movie is about? That we go through life blindly missing the point? Throughout the last Groundhog Day of the movie Bill Murray is focused less on winning his love than saving the boy from falling out of the tree, helping his old schoolmate by buying life insurance, and feeding his sense of creativity by learning to play the piano. When we see Bill playing like a professional, part of a team rather than standing alone, he seems happy. At that point we know that he will win the girl. He has become emotionally mature. He has made friends. He has finally learned how to have fun by giving joy to others. When Phil stops worrying about how to look good on camera and how to impress the girl, everything works out for him. He lets go of the need to perform. Instead of trying to scheme and get ahead, he engages with the inhabitants of the town and becomes one of them. He starts out as a loner and ends up with the whole town behind him. Whether or not he gets the girl we know that he will be OK because he has grown a heart. So what does this all have to do with where I started? In our modern world we are bombarded with information. On the news we try to listen to the newscaster, while another story moves across the bottom of the screen while the stock prices compete with the other two. We believe that we can absorb all this clutter and somehow make sense of it. Maybe the opposite is true. Maybe we need to get rid of the clutter to make sense of our world. In a twist of irony, our access to information may have made us less informed. Six months ago I was full of ideas of what I would do and become. Now my life has become smaller. I don’t mean that in a negative way. Letting go of expectations has freed me. We create the chains of our own prisons. We can also remove them and see the potential of what we can become. Like Phil in Groundhog Day, we can choose to be happy. If we’re lucky we won’t have to try as many times as Bill Murray did to get it right. © Sony Pictures Home Entertainment.